Anjali.M, Caroline Jessica Solomon, V.Vinothini. Biodegradation is a sustainable and eco friendly way to clean up contaminated environments. The biological processes harnessed play a major role in the removal of contaminants and they make use of the catabolic versatility of microorganisms to degrade/covert compounds which are toxic and difficult to breakdown. The study was done to determine the biodegradation of profenofos using fungal strains. Two fungal strains were isolated and characterized by 18srRNA sequencing. Minimum inhibitory concentration was checked on the fungal isolates. 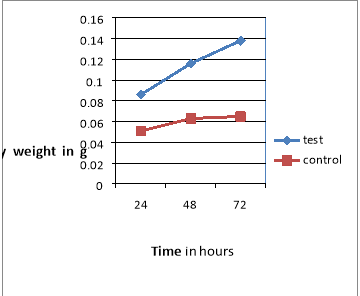 Growth kinetics was performed using Czpax Dox broth to understand the growth pattern of the fungal isolates in the presence and absence of profenofos. The biodegradation of the pesticide was then performed using the isolates grown on minimal and mineral media. Analytical characterizations of profenofos were also done using HPLC, GCMS, and FTIR. Key words: Profenofos, Growth kinetics, Biodegradation, fungal isolates. benefits are derived from the use of pesticides, however they also cause a wide array of toxicological and environmental problems and often persist in the environment for long periods of time. Organophosphorus insecticides are one of the most commonly used pesticides in agricultural practices. Out of a large number of organophosphate pesticides, profenofos is the one that is most widely used because of its broad spectrum of activity. Profenofos: O-4-bromo-2-chlorophenyl-O-ethyl S-propyl phosphorothioate (C11H15BrClO3PS, Molecular mass 373.6 g/mol]) is widely used for agricultural purposes in India and some other countries such as Australia, China, Pakistan, Egypt and Korea. .It is classified as moderately hazardous(toxicity class II) pesticide by WHO. Profenofos iw widely used on cotton, to control the tobacco budworm, cotton bollworm, armyworm, cotton aphid, mealy bugs, cotton strainers, whiteflies, spider mites, plant bugs, leafhoppers and flea hoppers ,they are used as effective pesticide for watermelon, Chilli peppers, tomatoes, soya beans . An estimated 85% of all profenofos is used to control lepidopteron species (the worm complex) at varying rates. It is a non systemic insecticide and acaricide which is found to have contact and stomach action. , and  Profenofos has been found to cause cholinesterase inhibition in humans; it over stimulates the nervous system causing nausea, dizziness, confusion, and at very high exposures, respiratory paralysis and death. It has been found that various bacteria such as Pseudomonas diminuta, Flavobacteria sp, Pseudomonas putida , Burkholderia gladioli  Pesudomonas aeruginosa, Staphylococcus aureus and Bacillus subtilis. fungi and actinomycetes  are able to degrade these pesticides in the soil. Fungi however have been found to be more efficient in doing so. There are several methods which can be used to degrade pesticides which have accumulated in the environment, these process are Photo catalytic degradation, Ozonation, Oxidative processes, Phytoremediation, photo-fenton reactions and bioremediations (Zenilda et al.). Of all these systems bioremediations is found to be most effective because it brings about complete mineralisation unlike in the case of physicalor chemical treatment. Treatment can be done insitu without having to excavate contaminated soil, thus it becomes extremely cost effective. This study mainly deals with the biodegradation of profenofos by fungal strains. Two novel fungal strains were isolated and sequenced. Profenofos was charecterized by various analytical techniques like HPLC, GC, FTIR. The inhibitory concentration of profenofos was checked on the isolates. Growth kinetics and degradation studies were carried out. To isolate and characterize fungal strains capable of degrading profenfos. Analytical grade Profenofos was purchased from the company Sigma-Aldrich.All the other reagents used in this study were of high purity and analytical grade. Agricultural soil sample exposed to profenofos was collected from the top layer between 0-20cm from the Vellore district, Tamil Nadu, India. was used to inoculate 50 ml Czapek Dox broth containing profenofos (60 mgL-1) and cultured in 250-ml Erlenmeyer flasks on a rotary shaker (at 100 rpm) at room temperature. From the above flasks 5ml of inoculum was added to 50ml of fresh Czapek Dox broth (containing profenofos) and incubated. From the transferred culture the fungal colonies were isolated by streaking the enriched sample in PDA agar plates and further sub-culturing was carried out on PDA slopes. 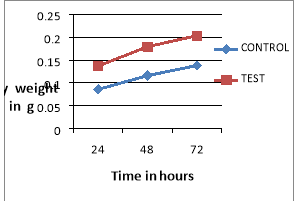 Minimum inhibitory concentration for the fungal isolates was performed using broth assay. M1 medium composed of NaNo3 ,2g; KCl ,0.5g; MgSO4 ,0.5g; Glucose,10g; FeCl3 ,10mg; BaCl2 ,0.2g; CaCl2 ,0.05g per liter at pH of 6.8 was dispensed in series of 250ml Erlen-meyer flasks. Profenofos was added at an increasing concentration (25mg/L,50mg/L,75mg/L). The flasks was inoculated with 1ml of fungal spore suspension and incubated at 30 Í¦±2 on a rotary shaker. These were incubated for 7 days and the mycelial mass from each flask was separated by filtration using Whatman filter paper no1. The fungal biomass was dried at 80 Í¦ C and it’s weight was measured using preweighed aluminium foil cups. The MIC was noted, which resulted in the complete inhibition of the mycelial growth in the flasks. Fungal isolates were screened for profenofos tolerance capacity by following gradient plate assay. The profenofos gradient plates were prepared by adding 20 ml of Czapax dox agar without profenofos and tilted at an angle of 30º at room temperature. The agar was allowed solidify and a wedge shaped layer was obtained. To the set base another 20 ml of Czapax dox agar containing profenofos was poured. Spore suspensions of the fungal isolates were streaked across the gradient using sterile cotton swabs. The Petri plates were incubated at 30±2 Í¦for 8 days..
To determine the growth pattern of the fungal isolates (LF5 and D2 ), the spore suspension was inoculated in a series of Erlen-meyer flasks containing Czapax dox broth. Two sets of flasks were prepared, one containing profenofos and the other as a control. They were incubated at 30±2 Í¦C on a rotary shaker at 140 rpm. The mycelial mass from each series was separated by filteration using Whatman filter paper no.1. The fungal biomass was determined by drying it at 80 Í¦C and weighing it using pre weighed aluminium foil cups. (S.Silambarasan 2012). Degradation of profenofos by the fungal isolates (LF5 and D2) was performed by inoculating 1ml of the spore suspension into a series of Erlen-meyer flasks containing M1 media. M1 media composed of NaNo3 ,2g; KCl ,0.5g; MgSO4 ,0.5g; FeCl3 ,10mg; BaCl2 ,0.2g; CaCl2 ,0.05g per liter at pH of 6.8, to this 15µl of profenofos was added which served as the only carbon source to the fungal isolates. Two sets were prepared, one containing profenofos and the other as control. The Flasks were incubated at 30±2 Í¦C on a rotary shaker at 140 rpm. Samples were collected from the flasks at 12, 24, 48, 72, and 96 hour which was further analysed by high-performance liquid chromatography (HPLC) . 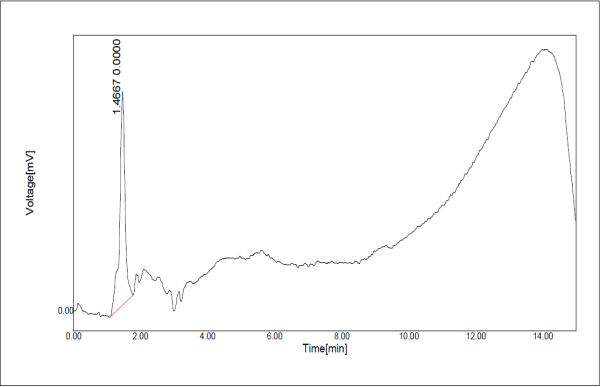 The pesticide residue analysis was carried out by High performance liquid chromatographyusing a gradiant mobile phase of methanol/water(85:15,v/v).Sample injection volume was 20µL and the mobile phase was programmed at a flow rate of 1ml min-1 .Gas chromatography(Varsha.P.Salunkhe et al.2013) and Fourier transform infrared spectroscopy(FTIR) were also performed using the appropriate instruments for the analysis of the pesticide residues from the sample. Selective enrichment methods were used in this study to isolate profenofos degrading fungi from agricultural soil. The study was carried out using two isolated fungal strains, the strains were named LF5 and D2 . The isolates were screened for highest tolerance to profenofos using gradient plate assay. The growth performance was recorded in terms of the length of the fungal growth in centimeters across the profenofos gradient plates. The isolates had the greatest length of growth in the range of 1 to 1.6 allong the gradient exhibiting tolerance. The MIC of profenofos determined for the fungal isolates was in accordance with the gradient plate results. Figure 1 and 2 depicts the growth kinetics of LF5 and D2 strains in the presence and absence of profenofos. The growth of the fungal strains was found to be suppressed during the initial stages; however there was an increase in growth during the later stages after the adaptation to profenofos. The biodegradation of the technical grade profenofos was estimated using the two fungal strains. The disappearance of the profenofos was monitored using HPLC. 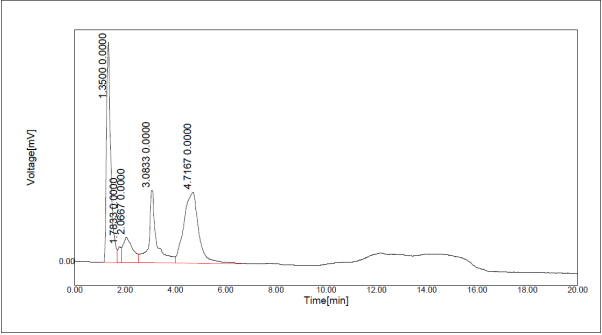 The results of the HPLC analysis of profenofos degradation are depicted in figure 3. Profenofos was found to be degraded on the 8th day of incubation. The two fungal strains isolated were found to be able to degrade profenofos and thus could be used as an agent to reduce the effects of organophosphate pollution in agricultural soils. Lathyrus sativus L., Ecotoxicology 19 (2010) 85–95. affinis, Drug Chem. Toxicol. 29 (2006) 255–267. areas of New South Wales, Australia, J. Environ. Qual. 30 (2001) 740–750. flounder (Paralichihys olivaceus), Chinese J. Oceanol. Limnol. 19 (2001) 57–62. carp (Cyprinus carpio L., 1758), Bull. Environ. Toxicol. 82 (2009) 569–573. Oreochromis mossambicus, Arch. Toxicol. 77 (2003) 227–232. of profenofos by human, mouse and rat liver preparations, Pestic. Biochem. duboulayi), Environ. Toxicol. Chem. 17 (1998) 1799–1806. Saadatullah Malghani, Nivedita Chatterjee, Hu Xue Yu,and Zejiao Luo. Isolation and identification of Profenofos degrading bacteria. Braz J Microbiol. 2009Oct-Dec;40(4):893-900. C.Tamilselvan, S.John Joseph, G.Muguthan, A.Sathish Kumar, S.Syed Musthaq Ahamed. Biological degradation of Metribuzin and Profenofos by some efficient Bacterial Isolates. International Letters Of Natural Sciences 9(2014)26-39ISSN2300-9675. Anwar, S., Liaquat, F., Khan, Q. M., Khalid, Z. M., & Iqbal, S.
C2A1. Journal of Hazardous Materials, 168,400–405.